And I only got her for $1.80 on ebay! EDIT: And just so no one kills me, I didnt put the elastic in her tail. xD She came with it when I bought her, and i havent removed it because i might make it worse. Thanks to Fleur-de-lis for the avatar! I am surprised you all don't think Pony Bride has regrind. I just assumed she was made of recycled plastic and the dyes in the reused plastic were coming out. You all are the experts though, so I will take your word for it that Pony Bride is not suffering from regrind, but just a silly child with a pink highlighter. I will have to try to sun fade her and see what kind of results I get. Thanks for all the pictures and info everyone. Keep them coming! I will update as soon as I can. At the same time, I think your thought is interesting, something I'll need to reconsider. I just think that the obvious Party Time regrind looks like a very different phenomenon than your pony bride marks. I just have to pause because one of my pony brides has a pink mark on her... a teeny one. And it could be a coincidence but I don't know. My DeviantArt Account | Ponies for Sale! Location: My heart's in the Highlands. hair elastics on ponies that have rusted into their mane/tail. EDIT: its a really bad picture, but her flocking is GORGEOUS. If you gently scrub her tail with rust remover and an old tooth brush, you can probably get most of that out (I had a Chocolate Delight with bad rust in her tail...got 90% of it out that way). As far as removing the elastic goes, I'd suggest doing it very carefully and with a pair of scissors--I wouldn't try pulling it out. I am currently closed for commissions. What do I do about a g3 having mold? I wasn't sure if it was mold or cancer, but the pictures here confirm that it's mold. The heads on g3s don't just pop off, do they? Will I have to cut the head off & reglue it? I don't want to mess it up, but I don't want to leave yucky mold inside either. The pony bride definitely doesn't have regrind. It's impossible for it to be so, because white isn't a dye, it's a bleach if the plastic isn't white in the first place. As has been explained, regrind is dye fading from plastic that was reused. Cancer and age spots are the same thing. It's just the plastic degrading. Nothing can be done about either regrind or cancer, and they don't spread. Boiling will not help. Please help hatch my dragons! Well, ponies seem to have this "pink highlighter" on many of them. Notice that it's not yellow, of green or blue, it's always pink. When Party time or Speedy (just to name a few) have regrind, it's pink. I believe it's probably all the same, either way, it's not contagous and doesn't go away. visually, what is the difference between pin dot mould and ingrained dirt? 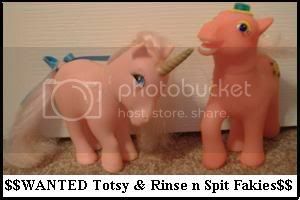 I just assume everything is mould but I see it on nearly every unicorn horn and several ear tips, mouths and hooves. Have my ponies just been dirty in a past life or am I right in believing it's pin dot? A really good question though! Anyone who has more to say about this? Pony cancer definetly does spread over time as I have found out with about half of my collection getting contaminated by a bubbles which had pony cancer on her flank. I always keep them WELL away now.. In my experienc, it's only the bright coloured ponies that get regrind, my speedy has it, I think steamer is prone to it too. I /think/ pindot spreads somtimes too depending on what type it is. If it's ingrained dirt in the plastic, i don't think it spreads, but there's no way to tell which it is. I also think pony mould and pony cancer are the same thing only some people to prefer to call it whichever one, and I believe one of the ways to stop pony cancer from spreading to other ponies is Oxyclean or somthin? 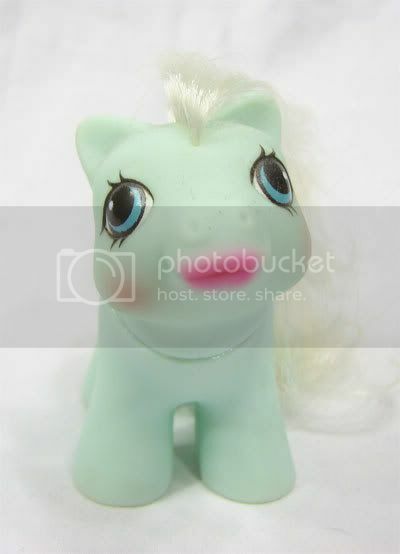 I also think pony mould and pony cancer are the same thing only some people to prefer to call it whichever one. This is one of the most confusing things, I think. Some people think cancer and mold are two different things, while others believe they are the same. what exactly is regrind, and why's it called that? From what I can gather, regrind is basically the breaking down of plastic, and the colours are sorta splitting up. I don't know why it's called that but I guess its because the colours are ground together to start with.